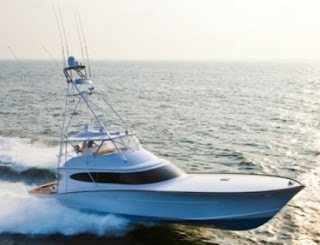 A current flagship from Bayliss, this is B14 launched in 2011 at 73 feet. But not for long as the custom sportfish builder from the Carolina has currently in construction an 80 nearly completed, and 84 feet. B14 showcases Bayliss woodworking skill, and its modern sleek sportfish lines again designed by John Ullberg. Teak toe rail, cover boards, and aft bulkhead are for all to see, while inside continues the epitome of luxury touch with all trims curved from single boards and no vertical cuts being made. The interior layout is a four cabins with an owners full beam suite to fore, VIP to port with an additional Pullman berth, guest third cabin to starboard with two bunk berths, and a crew twin with Pullman. Bayliss are build in cold molded wood and fiberglass, following the jig method which makes for a light, strong, and custom build. Bayliss 73 B14 is powered by twin 2600hp which gave her a top speed of 45 knots in light displacement mode.